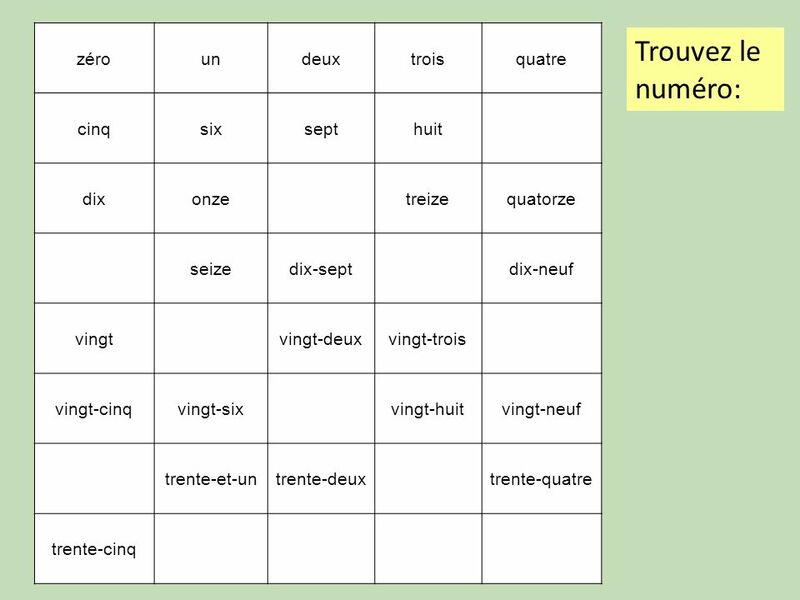 Number games in French Jo Rhys-Jones 2011. 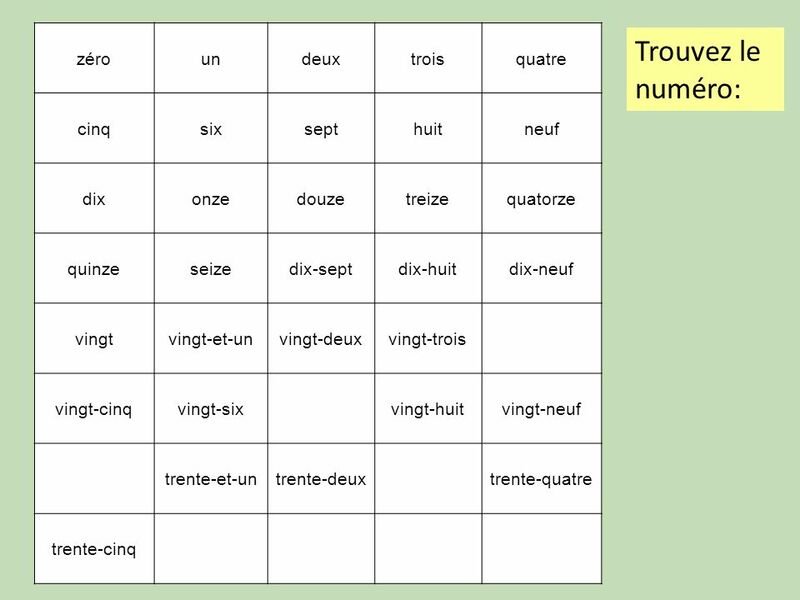 01234 56789 1011121314 1516171819 2021222324 2526272829 3031323334 35 Can you say all these numbers in French? 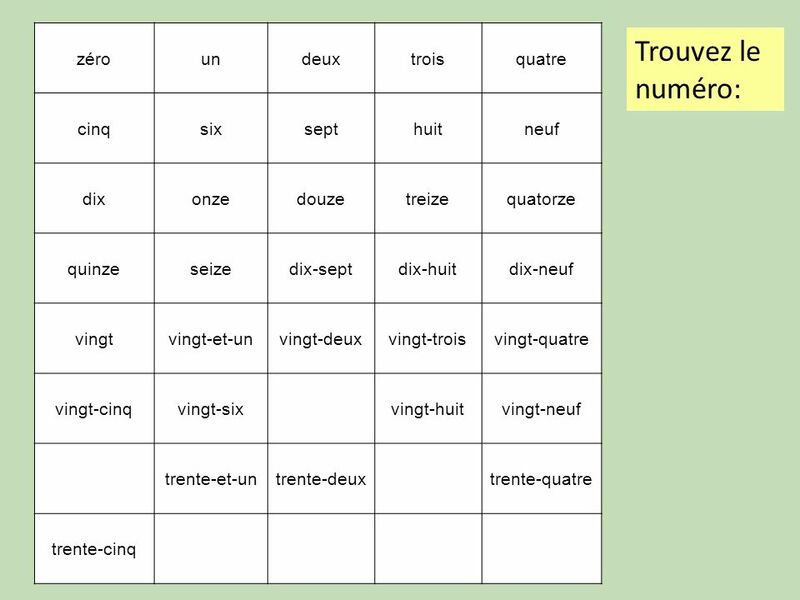 2 01234 56789 1011121314 1516171819 2021222324 2526272829 3031323334 35 Can you say all these numbers in French? Say them as your teacher points to them. 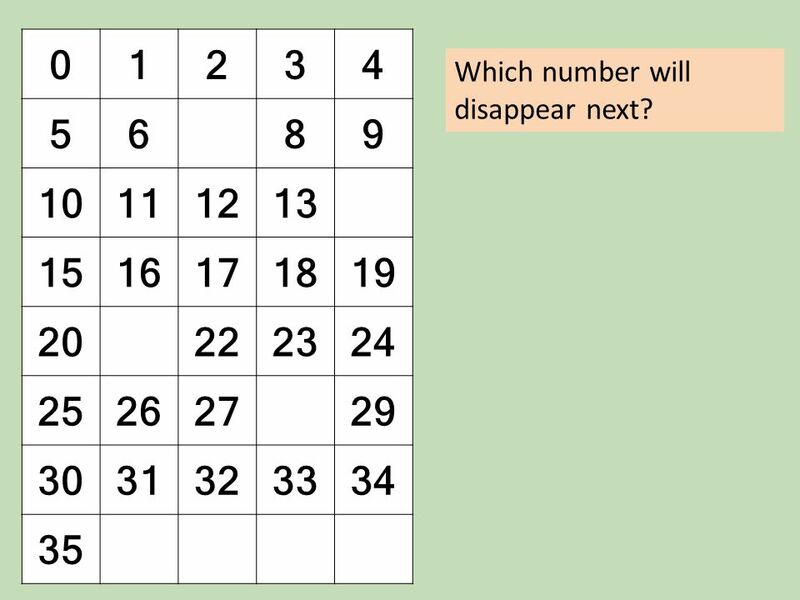 What numbers should go in the missing boxes? 4 01234 5689 1011121314 1516171819 2021222324 2526272829 3031323334 35 Did you guess which one? 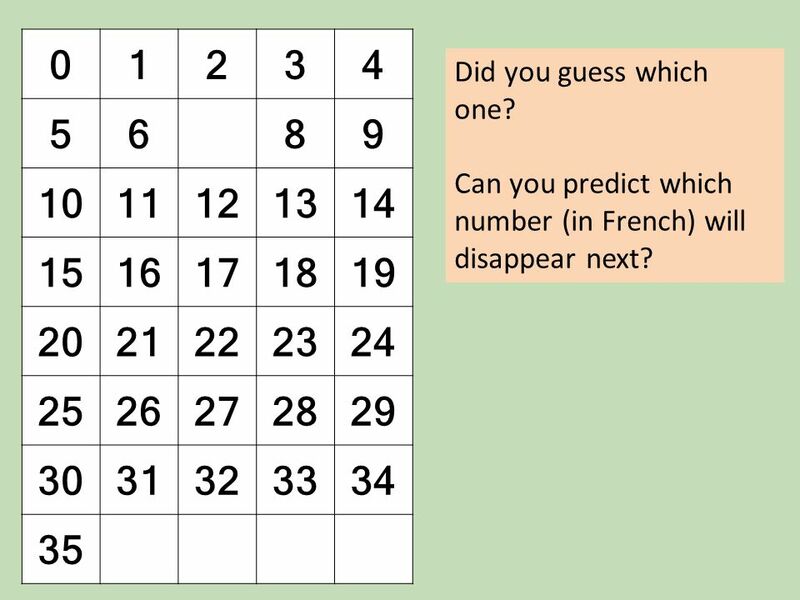 Can you predict which number (in French) will disappear next? 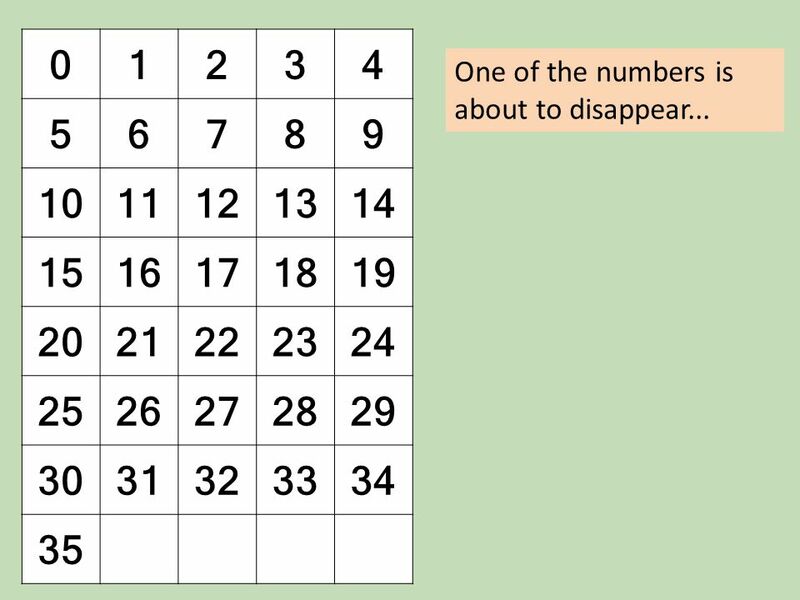 5 01234 5689 10111213 1516171819 2021222324 2526272829 3031323334 35 Which number will disappear next? 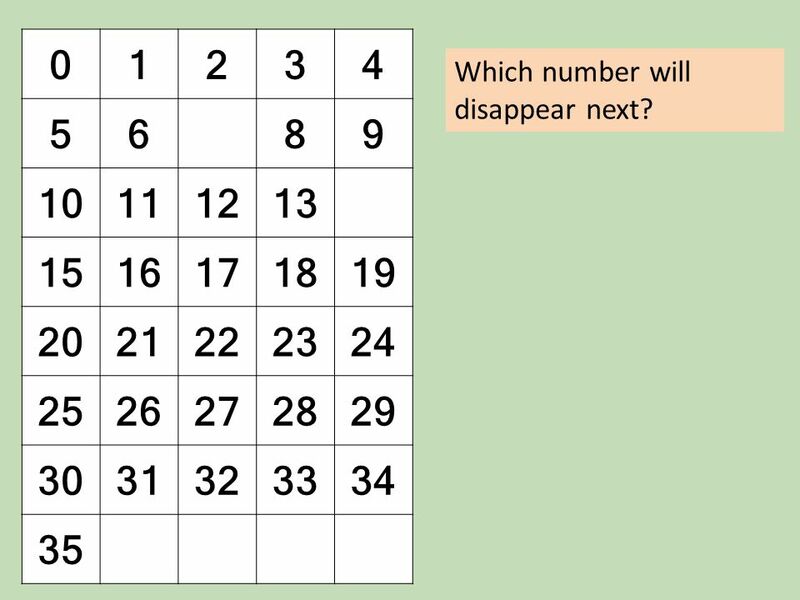 6 01234 5689 10111213 1516171819 20222324 2526272829 3031323334 35 Which number will disappear next? 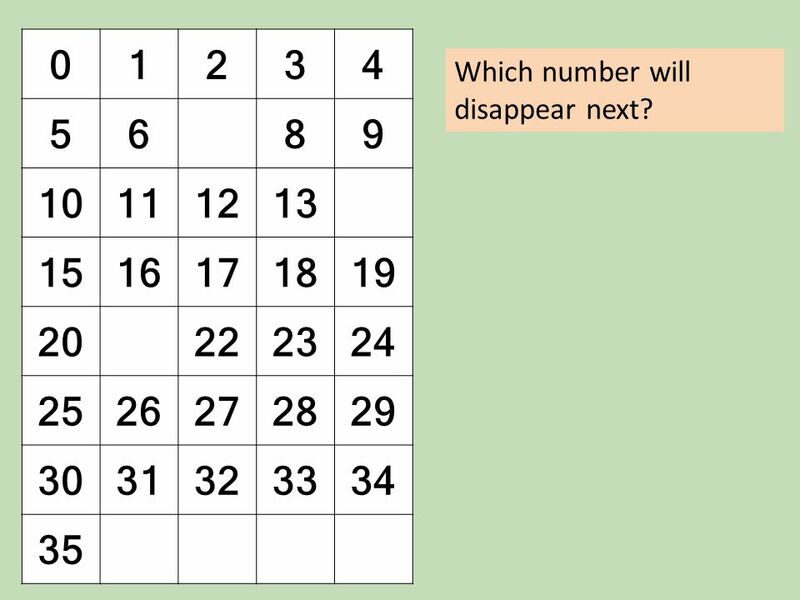 7 01234 5689 10111213 1516171819 20222324 25262729 3031323334 35 Which number will disappear next? 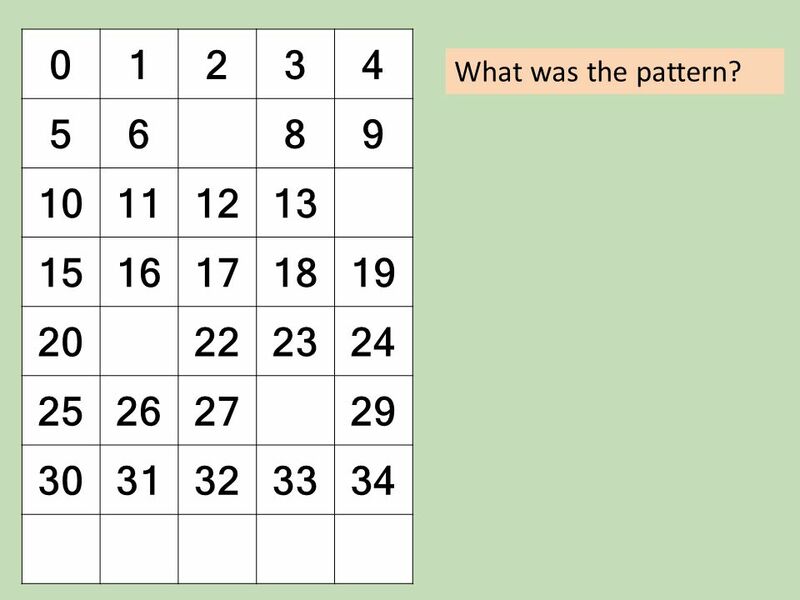 8 01234 5689 10111213 1516171819 20222324 25262729 3031323334 What was the pattern? 9 zéroundeuxtroisquatre cinqsixsepthuitneuf dixonzedouzetreizequatorze quinzeseizedix-septdix-huitdix-neuf vingtvingt-et-unvingt-deuxvingt-troisvingt-quatre vingt-cinqvingt-sixvingt-septvingt-huitvingt-neuf trentetrente-et-untrente-deuxtrente-troistrente-quatre trente-cinq Can you say all these numbers? Is it easier or harder? 22 zéroundeuxtroisquatre cinqsixsepthuitneuf dixonzedouzetreizequatorze quinzeseizedix-septdix-huitdix-neuf vingtvingt-et-unvingt-deuxvingt-troisvingt-quatre vingt-cinqvingt-sixvingt-septvingt-huitvingt-neuf trentetrente-et-untrente-deuxtrente-troistrente-quatre trente-cinq Bravo! 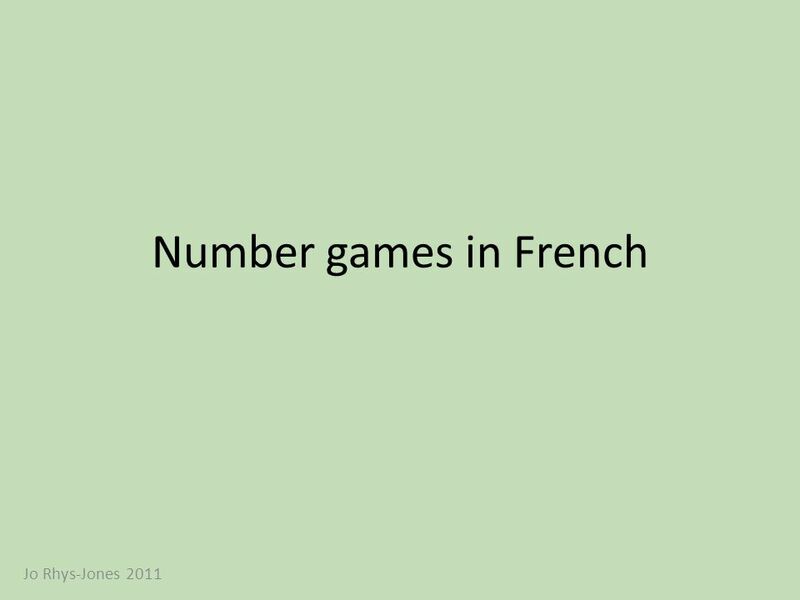 Télécharger ppt "Number games in French Jo Rhys-Jones 2011. 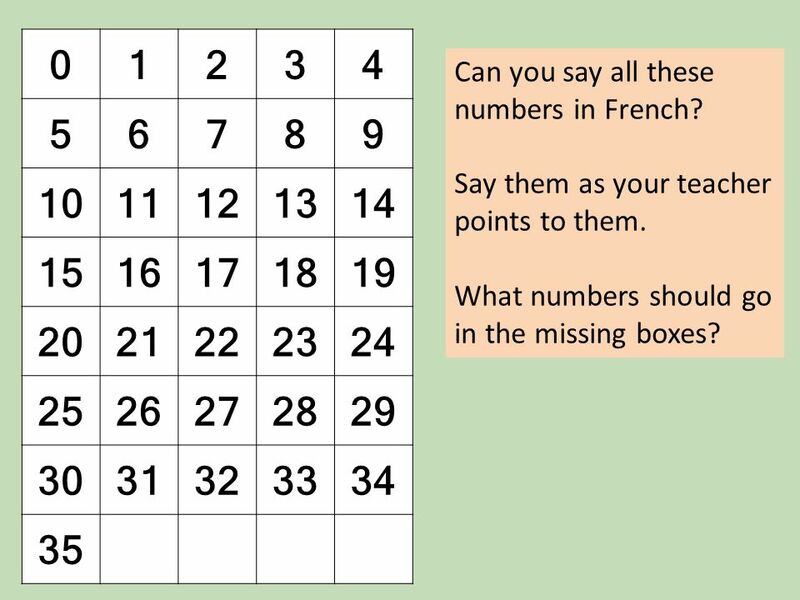 01234 56789 1011121314 1516171819 2021222324 2526272829 3031323334 35 Can you say all these numbers in French?" What is the time Mr. Wolf?. What is the time Mr. Wolf? LObjectif At the end of the lesson, you will be able to: 1. 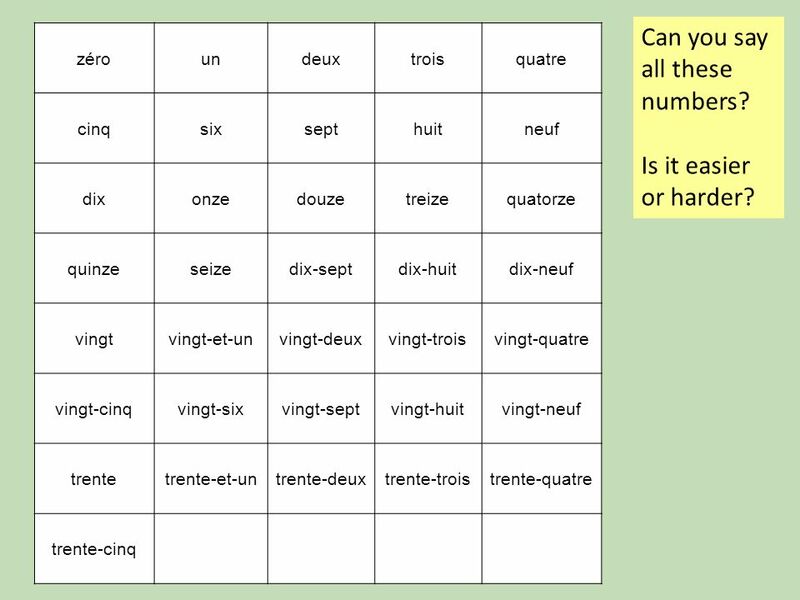 Ask someone the time in French. 2.Say the time in French: the. 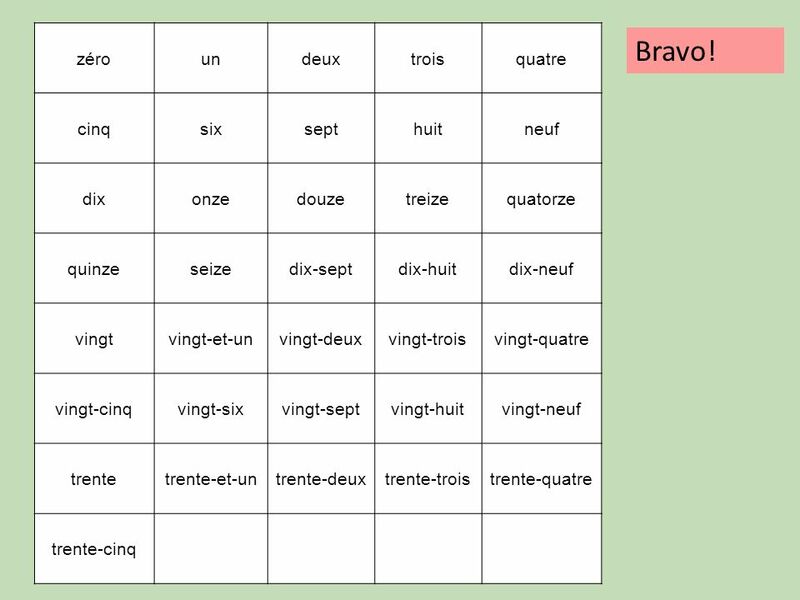 By the end of this lesson, I will be able to: 1.Ask someone what the time is 2.Tell the time, in French, using oclock half past quarter past quarter to. What is todays date and when is your birthday Ask someone what star sign they are and answer Say and ask for the time Say what you do for your birthday. C’est le 6 mai, (mil neuf cent quatre-vingt-quatorze.) C’est dimanche. 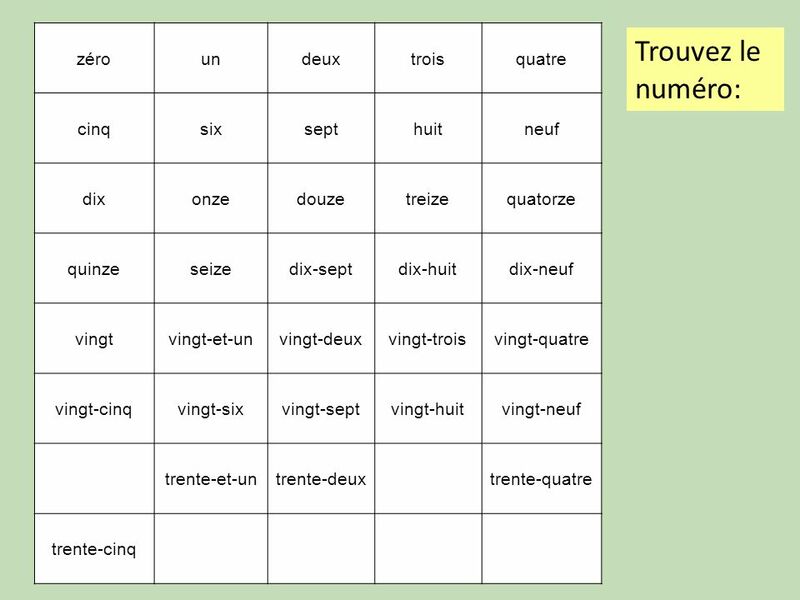 Objectives Revise the numbers Say and ask for the time in French Say when you do different activities Ecrivez la date. 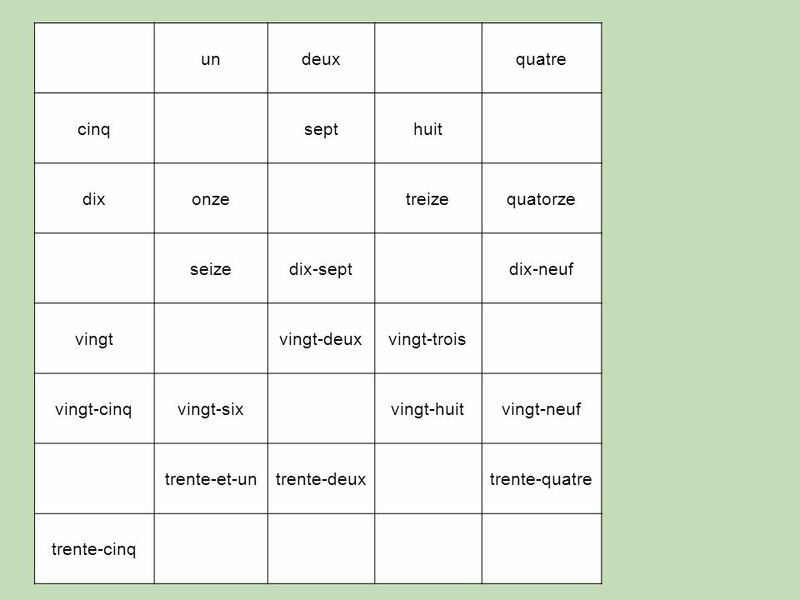 WALT: Telling the time in French using an analogue clock Quelle heure est-il? WILF: To say the time by itself (level 2) To say a full sentence to say the.